IS THIS YOU? OR IS THIS YOU? You book a cake consultation, meet with the clients, and after they've eaten your cake, they say, "Oh we have to visit some more bakeries, we will let you know! "...........only to find they booked their cake with another designer. You STILL charge under $500 for any cake you sell....yet you see other designers charging THOUSANDS. You think, "I'll charge more!" But you don't. You want to price cakes and charge your worth during cake consultations but you STILL undercharge for your cakes, again and again. Because you don't book many cake clients AT or AFTER the consultation, you charge $25 for brides to meet with you...just in case they don't book with you. But it would be much better if they actually booked you to make the cake for the event every.single.time. A potential client brings in yet ANOTHER Pinterest Cake she found online and wants you to reproduce the cake. No room for your creativity. You've officially become an order taker. If only you converted 50% more of the cake consultations you actually host, you would make at least $1000 more each month. But yea, that's not happening!! EVERY MONTH, YOU AIM TO GROW YOUR CAKE BUSINESS BUT YOU SEEM TO GET THE SAME RESULTS OVER AND OVER AGAIN. BE THE CAKE DESIGNER WHO BOOKS CAKES ON THE SPOT. DOUBLE YOUR CAKE BOOKINGS. DOUBLE YOUR CLIENTS. DOUBLE YOUR INCOME. I MEAN THAT WOULD BE NICE RIGHT? ....with confidence you quote each cake AT the cake consultation with confidence. $900 cake? Easy. And clients EXCEPT to pay that amount. ....run smooth, seamless, and fun cake consultations with your clients where you run the show and you get your clients to book cakes YOU want to design. .....Avoid clients saying, "Oh I have to think about it." or "I have more consultations scheduled at other bakeries." Begin to book clients AT the consultation, no need to the client to price shop, try other cake designers, they choose to work with you immediately! ....Process payments during every consultation instead of waiting and waiting until the client has made her final decision. FILL YOUR CAKE SCHEDULE BY DOUBLING YOUR CAKE BOOKINGS. 1. Knowing where to find better paying clients who will pay the prices you want to charge and how to attract them in. 2. Filling your schedule with cake consultations week after week with ideal clients you want to work with. 3. Converting your cake consultations into paying clients. Every client you meet books their order with you on the spot. 4. Up-selling during your consultations to maximize on the sale. This is required to make more money per sale. If these 4 steps aren't mastered, you are leaving money on the table and leaving your cake schedule up to chance. IF YOU WANT TO MASSIVELY GROW YOUR CAKE BUSINESS, YOU NEED TO INCREASE THE NUMBER OF CLIENTS YOU MEET WITH. THE MORE CAKE ORDERS YOU BOOK = MORE MONEY YOU MAKE. WELL, I'LL TEACH YOU EVERYTHING I'VE DONE TO COMPLETELY SKY-ROCKET MY CAKE SALES TO BECOME A BOOKED SOLID CAKE DESIGNER. DURING THIS COURSE, YOU WILL LEARN EVERYTHING I'VE DONE TO ACHIEVE A 90% BOOKING RATE. STOP attracting budget clients and begin to attract High-End Cake Clients with my proven strategy to transform your cake business. Upscale your entire cake business changing these 7 key areas to charge more for your cakes. Get crystal clear on your Cake Business Goals for 2017 and how you will achieve your income goals for the year and take action to double your bookings immediately. Know EXACTLY the type of clients you want to attract who will pay the prices you want to charge. Triple your self-worth in you and your cakes and feel confident charging exactly what you want to charge. Stand out from the local competition by only attracting high-end clients and become invisible to budget cake shoppers for good! Market your business as a luxe and upscale cake business to attract high-end clients. Create an effective cake business marketing plan for perfect execution to attract your ideal clients. Find out where your ideal cake clients are so you can market your cakes to her. Create a solid network in your local community where they consistently refer their clients to you. Implement my proven strategies to book high-end cake clients off and online. Learn my BEST Networking techniques to have the top industry experts in your area refer their business to you. Access my 10+ strategies to book 5+ cake orders every month and increase your cake sales by at least 50%. Access my proven closing strategies to easily overcome objections such as, "Let me think about it" "I have another consultation." "I'll get back to you." Learn my 3-point pricing strategy to easily charge $800+ per cake. Yes it’s possible! Take charge of your consultations and set the right expectations of pricing before, during, and after with your clients. Up-sell your clients' orders using simple sales strategies to sell your cakes well over $800 per order. Of course there are limited time bonuses for signing up Early Bird! Check them out below here. IF YOU STRUGGLE WITH BOOKING CLIENTS ON THE SPOT, SELLING CAKES WELL OVER $800+, AND YOU LET CLIENTS WALK OUT THE DOOR WITHOUT BOOKING WITH YOU, YOU ARE LEAVING MONEY ON THE TABLE. I want you to make the money to grow your cake business. THIS COURSE WILL TEACH YOU HOW TO BOOK MORE CLIENTS + FILL YOUR SCHEDULE + DOUBLE YOUR INCOME. AND YOU WANT THAT RIGHT? OF COURSE YOU DO! I'VE BUILT TWO SUCCESSFUL BUSINESSES OVER SIX YEARS, I KNOW A THING ABOUT BIZ AND MONEY. 1. I've built two successful businesses as a full-time entrepreneur in the past 3 years. My first baby is Aspen Charm Cakes & Pastries and also Cake & Success, my coaching business. Creating thriving start-ups is my thing! 2. I studied at Bonnie Gordon College of Confectionary Arts in Toronto, Canada. I've been trained by the best and expect nothing but the best from my clients and my own work. 3. It took 3 years to get my cake business off the ground. From selling cupcakes to high-end luxury cakes, from selling in the streets of Farmer's Markets to the Food Network/Cooking Channel, I've gone through it all! 4. From group coaching to private coaching to the next $497 downloadable program, I've done it all! I've invested well over $65,000 in my career as an entrepreneur and cake designer. I've worked with the top coaches and cake designers in the industry to insure you get winning results as well as I have. 5. I know exactly what it feels like to make a beautiful cake yet get paid..well pennies compared to what it actually took to make the cake. From dreadfully undercharging to now perfectly pricing, I know how to attract high-end clients and industry experts who absolutely love my work! Learn how to book high-end cake clients into your cake business this year. Your business will never be the same again! Cake Marketing 101 will teach you exactly how to market your cake business to attract high-end cake clients, double your cake ORDERS, and reach your cake income goals every month. Marketing is Required to grow your business. Let's get busy growing your business now! After completing High-End Cake Marketing Mastery you will finally attract better paying clients into your cake business and drastically increase your cake bookings! You will attract high-end clients consistently, double your cake orders, and reach your desired income goals every month. It's definitely not fun having a cake business and barely designing cakes week after week. I will give you the exact strategies to whip your business into share and market your cake business like a true pro! I created this course for you to stop hiding and consistently book cake orders with clients who want to work with you! But they must know you exist, right? 2017 is YOUR year to attract better paying clients into your cake business the easy and effective way. Transform your cake business now! 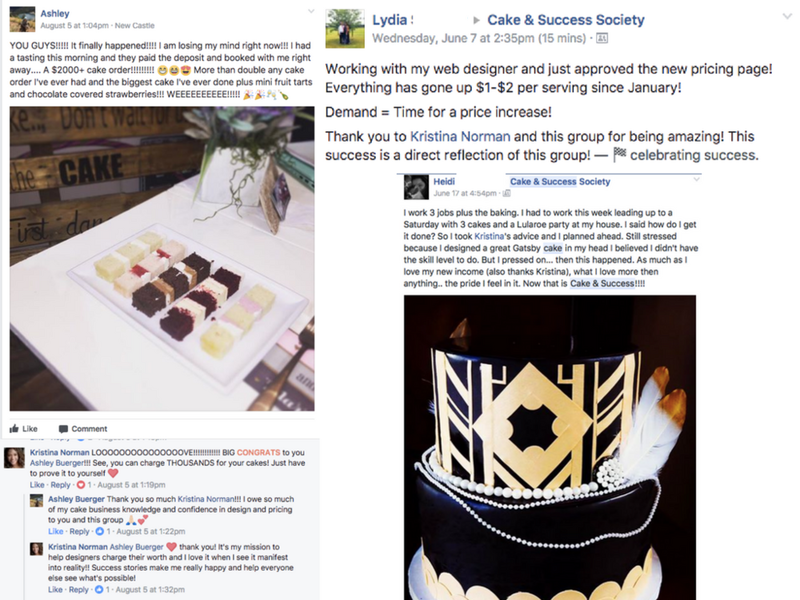 WHAT TO EXPECT FROM Cake Marketing 101! Know exactly how to price every single cake with confidence, knowing you are being paid your worth. Understand where and how to attract high-end cake clients who want to work with you and pay premium prices. Easily charge $8-$12 per slice. Discover how to book more clients on the spot at consultations and book more sales. STOP undercharging once and for all! You know you deserve to be paid your worth. How to easily network in your local area and have the TOP Industry Professionals refer their high-end clients to you, for free! Get my secrets on how I sell consistently sell cakes over $1000 per order. SOUNDS PRETTY Awesome RIGHT? THEN HURRY AND SIGN UP. DON'T WASTE ANOTHER MONTH not living the cake business you truly deserve! P.S. What I teach you inside this course is exactly how I transformed the way I operated my cake business for life. I didn't take advice from broke cake designers off the internet. Stop asking people, "What would you charge for this cake serving 150 people?" "Why do I keep attracting budget clients in my business?" I will teach you how to attract better paying clients into your cake business, increase your cake bookings by 50%, and charge more for your cakes. This WILL transform your cake business forever! Become a marketing cake marketing machine! Get your business in front of the clients you want to work with. my clients get results..take a look! HAVE A Q? WELL, I HAVE YOUR A RIGHT BELOW! HERE ARE SOME FREQUENTLY ASKED QUESTIONS YOU MIGHT HAVE ABOUT THE PROGRAM. I’M A NEW CAKE DESIGNER - CAN I STILL TAKE THIS PROGRAM? What better way to start your cake business off right with proven strategies. You will be glad you did! I’VE BEEN IN THE CAKE BUSINESS FOR 5+ YEARS, WHAT CAN I POSSIBLY LEARN? Are you earning $1000+ for each cake order? Consistently.....not, every so often. If not, you should be for your talent! This program will completely change the way you see yourself, your work and the way you run your business. Cake designers should be paid their worth. Be an owner who expects to earn a living from your business. I'M AFRAID OF CHARGING PREMIUM PRICES IN MY TOWN. WHO WILL PAY THEM? I think it's best to approach your business as an owner who understands that undercharging or charging low prices is not the way to run a business. When you begin to charge your worth, your clients will pay your worth. It starts with you getting clear that barely making a profit in your business is not the way to run a business. Right Now! If you want to take advantage of the limited time bonuses, I suggest you register right away. The program will start soon so you make sure you register for the live workshop. Once you are registered, you will get access to Module One right away. This is a home study course for you to go at your own pace. You do get full access to me inside of my Member's Only Facebook Group where you will get support, coaching, and guidance from me to help keep you on track to creating the high-end cake business you truly want. HOW COME I CAN’T FIND THIS INFORMATION FOR FREE TO HELP MY BUSINESS? There’s so much information going around the internet about how to make money in a cake business. And most of it doesn’t tell you exactly how to charge premium prices or charge more than $4.00 per slice. Don't take advice from cake designers who charge what you charge. It's like taking financial advice from someone who is broke. I am giving you the exact blueprint I used to completely change my cake business around. It’s best to learn from one person who’s been there, done that vs. 100 opinions. I will guide you every step of the way to change your business. 10 Recorded Modules with me - over 20 recorded videos. 10+ workbooks with over 100 pages - including templates, checklists, and worksheets to completely change the way you operate your cake business. A private Facebook community filled with your cake sisters for additional support and coaching fro me every day. An exclusive reading list revealing the books and resources that supported me in the big money transformations. OH, I'LL WAIT later to sign up. How long have you been running your business NOT getting the results you want. Do you really have time to sit and wait for your business to transform or are you going to do something about it. Business Owners who take action are the ones who get results. Take control of your business and learn how to attract more and better paying clients into your cake business right away. Please click here to review the refund policy. Hey! My question isN'T listed! No problem! Click here to send me an email about the course and I'll answer it within 48 hours business days of arrival. Build your cake business booking better orders! Quantity of Quality! BEFORE YOU GO, A NOTE FROM ME! If you are reading this, I know you are really looking for change in a BIG way. You truly want to create a cake business you love and you want to work with clients who cherish your work and your skills. When I first started my cake biz, I got sooo freakin’ frustrated with how to make money. I needed to support myself and make money to pay the bills. I had to learn the long way how to get really understand pricing, expenses, and owning my worth as a designer. I knew I needed a change, a BIG change. I was so done undercharging and overworking over a cake. This marketing course is geared to help you step into the role of a true business owner who charges her worth, understands her numbers, and how to find high quality customers. If you are done with nickel and diming yourself, do yourself a favor and charge more! Understand your costs, raise your worth, attract better clients who want to do the work you love. Once you fully commit to your business growth, you will step into a whole new whelm of doing business. Let me support you by learning what worked for me. I work with clients who I love, do the work I love, and get paid what I love. I want the same for you! I can’t wait to work with you in the Cake Marketing 101 Course!